Are you lost in a world full of mattresses? Does the name Tempur ring a bell? Tempur has been a major mattress manufacturer in the UK, US, and elsewhere around the globe for many years. Their ultra luxury memory foam feel has become a staple of sleep for many. This week, we’re finally putting the Tempur to the test. For this Tempur mattress review we’ll be looking at Tempur’s Cloud Deluxe 22 model. Will this mattress live up to its expectations? Continue reading below to find out! Want to see the short version of this review? Click here to read the review summary. The Tempur Cloud Deluxe 22 mattress measures 22cm deep and is made from 4 layers of memory foam. 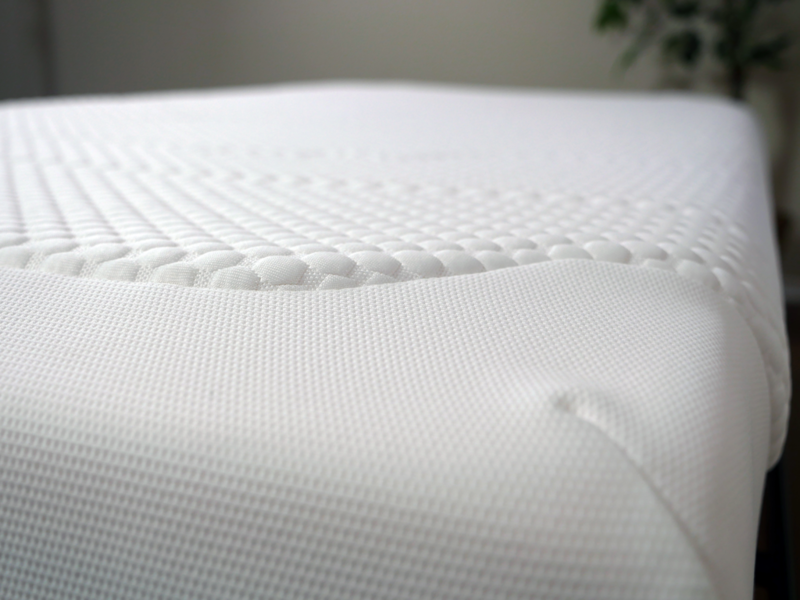 Top layer (comfort) – 1.5cm of super soft visco elastic memory foam. This quilted layer of foam helps to welcome the individual to the mattress with that initial soft feel. Second layer (cooling & comfort) – 2.5cm of visco elastic memory foam. The second layer is designed to provide cooling & comfort for the individual. This layer of foam is very soft and slow to respond, creating a deeper level of sinkage. Additionally, this layer works to release heat from the sleeper in order to keep the sleeping surface cooler. 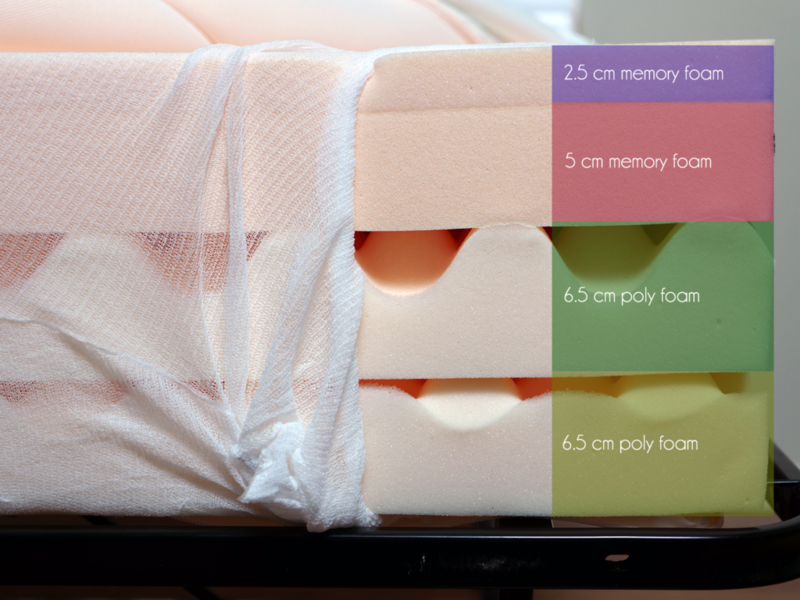 Third layer (pressure relief) – 5cm of visco elastic memory foam. This layer was placed under the 2nd layer in order to provide a high level of pressure relief. This layer of visco foam has a slightly faster response time. Therefore, it works to offer a high level of pressure relief without continuing to restrict the sleeper with even more sinkage. Fourth layer (support) – 6.5cm of polyurethane foam. 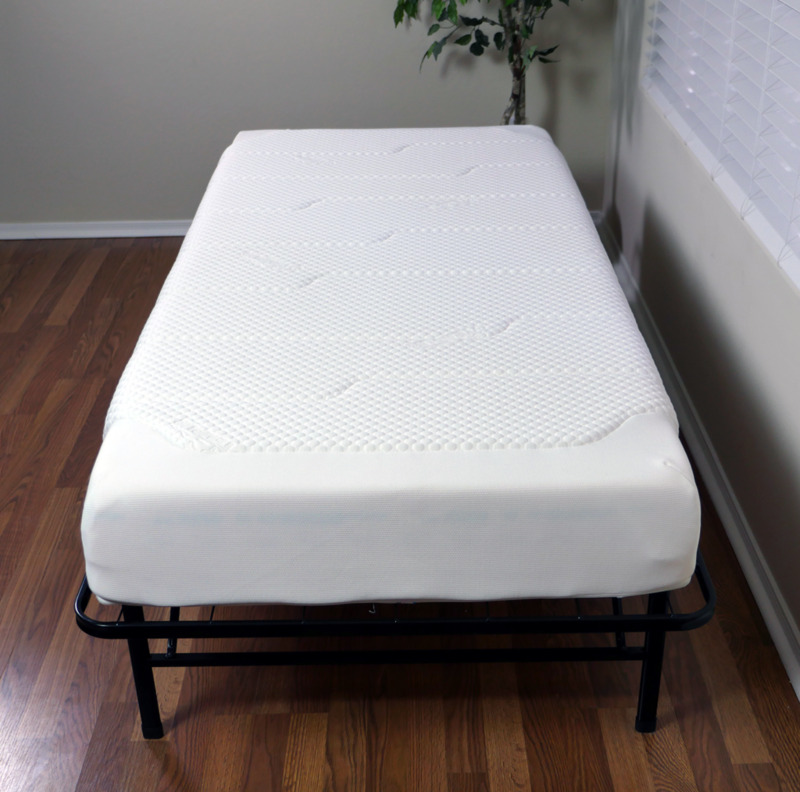 The fourth layer of the Tempur offers further support for the sleeper as well as the foam layers above. This layer is breathable allowing for higher levels of airflow throughout the mattress. Bottom layer (foundational support) – 6.5cm of polyurethane foam. 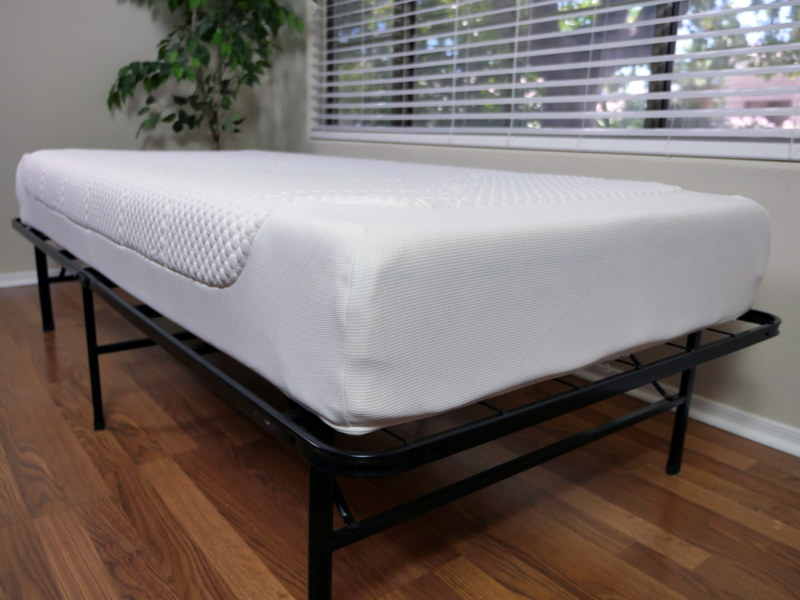 The bottom layer is identical to the fourth layer (convoluted polyfoam) and acts as the deep compression support for the sleeper as well as the foundational support for the mattress. The cover of the Tempur Cloud Deluxe mattress consists of a blend of polyester (98%) and elastane (2%), also known as spandex, along the top; the sides and base of the cover are 100% polyester. In addition, the cover of this mattress contains a layer of super soft foam. The blend of these materials makes for a soft, plush, and responsive cover. After pulling on the cover from several different angles, it returned to its original shape without issue. Breathability also plays a large role with this cover. As a slightly thicker cover, you would expect less airflow through the mattress. In contrast, the polyester / elastane combination helps to improve breathing and removing the heat that the body tries to create. Visually, the cover is basic with an all white design with a dotted pattern and embossed “Tempur” logo. The Tempur Cloud Deluxe mattress is unlike the vast majority of mattresses I have previously tested. On a scale of 1-10, where 10 is the most firm, this mattress scores a 5 out of 10. To begin with, the Tempur mattress provides a deep level of both sinkage and hug, the body contouring of this mattress is nothing short of impressive. When I first lied on the mattress, I noticed a slight amount of sinkage and hug progress into a greater depths over the course of about 30 seconds. The hug and sinkage didn’t leave me feeling as trapped as previous Tempur mattresses I’ve tried have. That said, the depth and slowness to respond may make some sleepers uncomfortable. The pressure relief of this mattress is quite good as no matter how much pressure my body tried to create the materials below were able to absorb my weight and provide a comfortable sleeping experience. As we move onto support, the Tempur once again proved its quality. Sleeping on my stomach wasn’t ideal, as the mattress sinkage proved to be a little too deep. Therefore, my hips sank in lower than my chest and legs, creating an awkward angle and lack of support to my lower back. This said, there were no issues on my side or back. The Tempur Cloud Deluxe did an excellent job supporting me whilst sleeping in both of those positions. The cooling properties of this mattress were relatively average. With such deep levels of sinkage and hug it can be tough for a mattress like this to keep the individual cool. The Tempur did not sleep overly warm or hot by any means, but the deeper sinkage and hug may create a warmer sleeping environment for individuals with greater body mass, which is something to keep in mind. Another characteristic to be aware of is the overall sinkage. As a lighter individual (64kg / 10 stones), I was still seeing a fairly deep level of sinkage. For heavier individuals you can expect even greater depths of sinkage. This combined with the slower response time of the Tempur foam materials can create an environment that causes some sleepers to feel trapped and / or sleep too warm. It’s a good idea to try the feel of a Tempur mattress in-store before buying to make sure you enjoy the feel that’s become the hallmark of Tempur. All mattress reviews on Sleepopolis go through a short series of sinkage tests. These tests are designed to provide you with insight into how the mattresses will perform under various conditions. Lying on back – whilst lying normally on my back with all of my weight spread evenly across the mattress, I saw 4-7.5cm of sinkage. Lying on side – as I rolled over onto my side, I saw 4-9cm of sinkage. Sitting on the edge (conservative) – as I sat on the edge with my bottom slightly further back on the mattress, I saw 9-10cm of sinkage. Sitting on the edge (aggressive) – in a more aggressive sitting position with all of my weight on the absolute edge, I saw 14-15cm of sinkage. Standing in the middle – whilst applying all of my weight to one specific point on the mattress while standing, I saw 15cm of sinkage. Keep in mind, sinkage results may vary based on body weight and body type. As a reference point, I weigh 64kg / 10 stones. Who should buy the Tempur Cloud Deluxe mattress? The Tempur Cloud Deluxe is a quality mattress and a top performer overall. If we look at the materials, design, and build quality in a vacuum Tempur is one of the best choices. That said, with any mattress purchase the price point, returns, and trial period are a huge factor. A King size Tempur Cloud Deluxe is ~£1,750. For my money, that’s just unreasonable, especially when you look at other options on the market. Many new online mattress companies are now building beds at an equal level of quality and performance, but at a much better price point and with extremely friendly trial periods. At the very least, I think it’s worth checking these less expensive choices out first, given the trial period, before simply diving into an expensive Tempur. Want a medium firmness – this mattress scores a 5 out of 10 on the firmness scale, where 10 is the most firm. Don’t mind spending a large amount of money – Tempurs are not cheap. Typically, these mattresses cost 2-3 times what other online retailers are selling their mattress for. Therefore, do not expect to purchase a Tempur mattress at a low price. The Tempur Cloud Deluxe 22 mattress is an exceptionally well designed and built mattress. The materials used create great pressure relief and support in a classic Tempur-style feel. 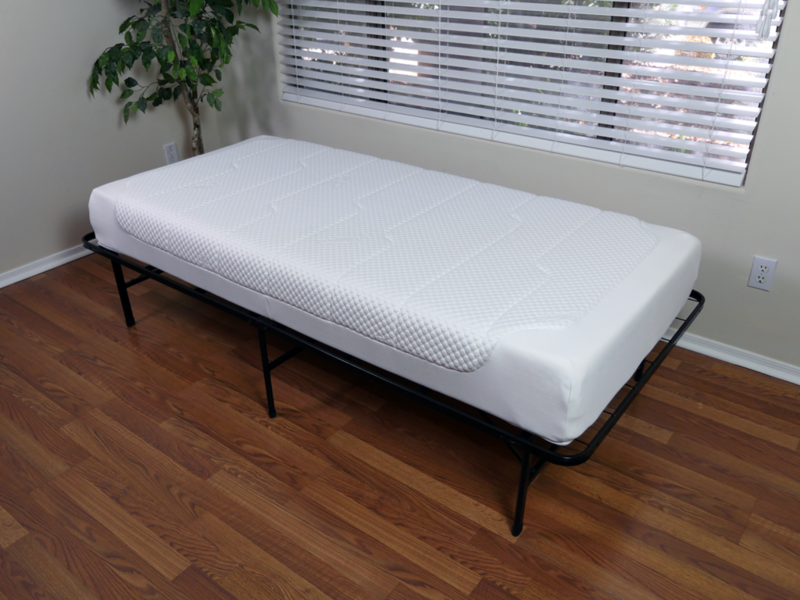 The mattress does have a slower response time, which can leave some sleepers feeling trapped. The mattress isn’t excessively warm, but the deeper sinkage can lead to more heat build up for some sleepers (especially heavier sleepers). The biggest down side is simply the price point. At £1,749 the Tempur is quite expensive.